Sadly I have not had time to read any books lately, it's basically just been schoolwork nonstop. During my freetime I get caught up on the blogs I read and other internet things. 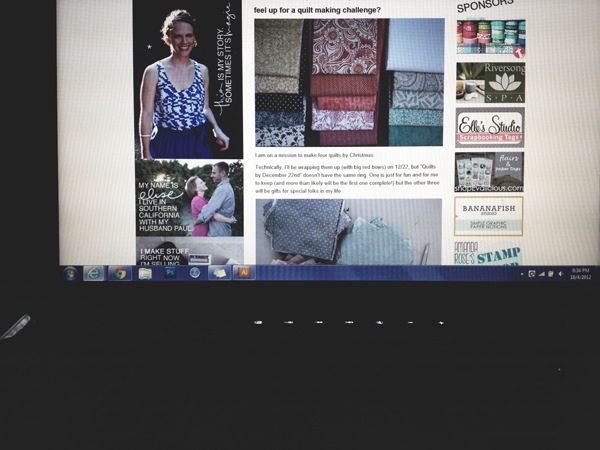 This was a blog post today by Elise, I love her quilts, I'd love to join her in her quilt making challenge but I have no idea where to start, and I don't think I'd be able to have the time. Hopefully one day I can make one, I love quilts so much more than comforters on my bed but I cannot seem to find ones in a design I like, so it would fix that problem. Basically for now I'm just going to sit here working on work and pining for the day when I have the freetime to be crafty.